Superb service and delivery. Thank you. Excellent service again & super fast delivery. Will recommend! 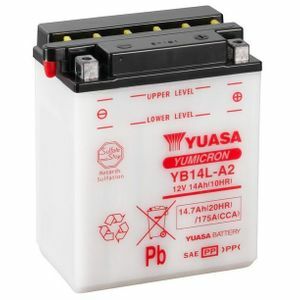 A well priced battery, delivered next day ,very well packed, will deal with again. Excellent product great supplier very efficient. Everything as described. Fully charged in a half hour. Cranks motor easily. Impeccable service. Will use again. Came so fast it surprised me.Charged ready to go.I filled it with the acid supplied and away I went.Started first time.Great service Great price.Thanks. Very prompt service! The battery arrived first thing the next day. I charged it up as per the recommendations. It works very well with plenty of power to turn the engine over. It is an old Briggs and Stratton engine that the previous battery always struggles to turn over. It starts first time every time now. Was not made clear that this battery required electrolite. My previous battery came ready filled and when I tried to check all I could find was that batteries came charged and ready to fit. I did not therefore chose the option of adding this to my purchase. Good battery and very prompt delivery. Excellent service - first class. Will use again and recommend.